"It's not like he knows much about the theory of relativity, nor does he have an opinion about quantum physics. In fact there isn't a lot about Doug Thompson to compare him with Einstein. Except maybe the hair, an easy smile and eyes that light up when talking about his latest project, all of which combine to lend something of the mad scientist about him. Take photo sublimation for example. That's the relatively well known method of transferring a digital image onto a countertop surface through a process of heat and pressure. It's a pretty neat trick, especially when you consider the procedure includes converting the image into a gas before transferring it into the countertop deck. Problem is, it's not very durable. "You have to protect the image from ultraviolet light or it will fade out completely," explained Thompson. "It also doesn't hold up well to scratches. And you can't sand it very well." It was time for a more permanent solution. So Thompson set to work researching alternate methods for embedding images into the cultured marble surface. According to company records, he conducted more than 200 failed experiments before hitting on a winner. "We were going in a completely different direction and came across this process by accident," he said. "You just can't underestimate the value of making mistakes, particularly with the potential they have for finding a better outcome." He began with the inks used to create the image. Typical photo sublimation uses high-resolution ink jet printers and water-based inks for printing the initial image. These inks are highly UV sensitive, which is why the image fades when exposed to sunlight Thomson developed a printing system that uses inks that are both UV stable and compatible with the cultured marble matrix. To make the image scratch-resistant, Thompson came up with an extra-thick, non-yellowing clear coat as an outer layer of protection. (Typical gel coats, which are the protective surface on traditional cultured marble, will yellow over time.) The clear coat can be sanded and polished without damaging the image below. Although the standard finish features a high-gloss sheen, sheets can be produced with a satin or matte finish. 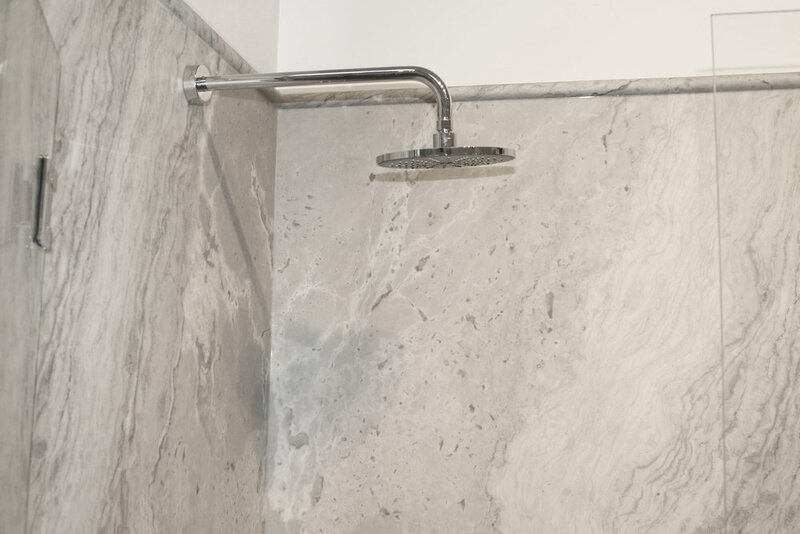 Also, depending on the mold used to cast the sheets, the protective clear coat can be textured to create non-slip surfaces, which are ideal for use in showers and other wet environments. Tyvarian film before being laid down on resin clear coat. Thompson has spent many years developing the photo embedding process for Tyvarian International in his capacity as R&D guru for the company, but his innovations extend to other products introduced over the years. For instance, Thompson helped develop the Integra line of sinks, which features lightweight yet tough acrylic bowls reinforced with fiberglass for use with solid surface. "We were the first in the industry to offer acrylic bowls for under-mounting." he said. He has experimented on many other things in the cultured marble industry, helping Tyvarian International grow to the company it is now. When ever a new idea comes up, Thompson is willing to don his white lab coat over his t-shirt and jeans and become Tyvarian's resident mad scientist again. A completed panel with the white marble matrix backing.